Why are some foods considered "brain foods"? What makes them so good for you? What are some examples of brain food that you could include in your diet? Try it for a few days and see if you can tell a difference. Include scientific research to support your decision to try a particular brain food. Some foods are considered “brain foods” because of the vitamins and nutrients they contain that help the mind and body feel energized and function at its best. In addition, they aid in preventing future conditions, “brain foods” are all good for you in moderation. For example, pecans and peanuts contain choline which aids in memory and brain development, green tea contains catechines which enhances memory and focus and fights mental fatigue, and dark chocolate is a powerful antioxidant that contains several natural stimulants which increase the production of endorphins while enhancing focus and concentration. Studies showed that the powerful antioxidants in strawberries, spinach and blueberries can improve the ability to communicate even among brain cells already showing signs of age-related damage. Some “brain foods” that I could include in my diet are pecans, strawberries, blackberries, green tea, eggs, yogurt, broccoli, and chocolate. After drinking green tea for a few days, I noticed a slight difference, I felt a little bit more energized throughout the day. According to research and case studies, brain foods are basically foods that contain vital nutrients and vitamins that improve cognitive functions. These foods increase mental strength and improve overall energy which can lead to a more positive attitude. The reason brain foods are important is because the brain, in comparison to other organs, uses a large proportion of the body's energy. This should be no surprise since the brain controls many of the functions of the body. In order to compensate for all of its functions, the brain requires large sums of energy which can be gained from brain foods. Some examples of brain foods are walnuts which contain anti-inflammatory nutrients that increase blood flow, olive oil which contain monounsaturated oil that retards the aging of the brain, and berries which contain nutrients and vitamins that slow down the regression of memory and focus. One way that I thought I could integrate brain foods into my diet were by eating salads from the cafeteria every day for lunch. Typically, I eat the salads with the vinaigrette that it is served with as well as with meat or chicken and a hard-boiled egg. Like mentioned earlier, the oil in the vinaigrette helps retard the process of an aging brain as well as slow down the breakdown of protein from the chicken or other meat. The egg also provides choline, which enables better learning ability. Also, at home I often eat vegetables and fruits as snacks, which not only increase my metabolism, but help in the retention of memory and mental energy. After sticking to this diet for two weeks, I've noticed that I am less stressed out than normal, have a bit more energy, and am able to concentrate more in the classroom. Although it is hard to balance a healthy diet for most, it is very important for everyone to do. These are obviously some foods that are better for you than others. An example of a type of food group to try to choose from is called “brain food.” According to research, some foods are considered “brain food” because they are good for your brain, give you energy to work and think. They are good for you because they provide nutrients that help you grow and develop. Some examples of these foods are eggs, fish, blueberries, and dark chocolate. Before doing this challenge, I really didn’t eat a lot of these foods. I decided to try all of these foods as well as some more. On Sunday, I had eggs for breakfast and fish for dinner and felt like I had eaten well that day. Besides Sunday, I really didn’t feel that different because I didn’t eat a lot of these foods. Brain food is food that enhances your intelligence. In other words it s believed to be beneficial to your brain. Foods are considered brain food when they influence the way the brain works. These food help you concentrate, keep you motivated, increase your memory, speed up reaction reflexes, relieves stress, and prevents the brain from aging quickly. Some brain foods one can include in their diet are fish, eggs, nuts, bananas, and yogurt. Fish has a fatty acid that is beneficial for the brain, bananas induce sleep, and nuts enable you to think clearer. This week I ate fish, bananas, and peanuts to try out the brain foods. I didn’t really see a big different but one thing I did notice was that I was more focused when I was doing my homework and studying. Maybe if I continued eating those foods a bigger difference would be noticed. Brain food is food that increases the functioning of the brain. In my opinion fish is the best "brain food". Fish keeps blood vessels in the brain healthy. It also provides nutrients to nerve cells that allow the cells to function at their highest level. If you can't eat fish, experts recommend to take fish oil supplements. Eating foods with a low-glycempic index is recommended. Foods with a high-glycemic index are known to cause the body to feel tired and sluggish. Almonds, acai berries, avocados, chicken and leafy greens are only a few items that are good brain food. I try to eat these types of food on a regular basis and I feel good and energized. When I don't eat healthy I can definitely feel a difference in my energy levels. According to research, brain food is food that increases your brains functions and allow you to think with an open and clear mind. A hazy feeling head could be due to lack of proper nutrients to the brain. Brain food is used to counteract that, it is proven that certain chemicals from foods you eat go right to your brain cells. The reason these brain foods are so beneficial to you is because they contain important vitamins and minerals that help you maintain focus, slow down the brain aging process, provide relief from stress and increase blood flow in the brain which speeds up thought process and keeps you motivated. Take berries for instance, they contain vitamins C and E which are anti-oxidative vitamins. Oxidation which is what those minerals help prevent can damage brain cells. Some brain foods that I have included in my diet are a daily consumption of some type of berry from blueberries and blackberries to strawberries. My family also keeps our pantry loaded with a lot of almonds and walnuts. I am a fruit guy for sure and would even prefer eating a banana or apple over chips or crackers so I always eat at least 1 banana a day and occasionally eat an apple, usually 2-3 times a week. After I eat these healthy "brain foods" I usually am more optimistic about everyday tasks and I also eat at least 1 type of brain food on days I take tests at school to improve my thought process. According to reasearch, brain food is food that helps your brain function on a daily basis. Brain food also is a vitamin supplement that increases your memory. These food help you concentrate, keep you motivated, speed up reaction reflexes, relieves stress, and prevents the brain from aging quickly.The reason brain foods are important is because the brain, in comparison to other organs, uses a large part of the body's energy. This should be no surprise since the brain controls many of the functions of the body. The brain requires large sums of energy which can be gained from brain foods. Some examples of brain food are salmon, fish, eggs, nuts, yogurt and salad. These things are good for your brain but are healthy to eat on a daily diet as well. I tried this challenge and this helped my weight control and not just that but also it just made me feel better than eating junky food I do not need. Also trying this challenge helped my sleep. I really had no idea that just changing the thing I eat for a few days can effect my eating habit and my sleep. I am going to consider keeping this in my diet andsee how that affects my overall health. New research has surfaced that suggests certain foods increase cognative functions in the human brain. Diets that are rich in antioxidents and anti-inflamitory nutrients can also increase concentration and focus. Examples inclue walnut, olive oil, berries, coffee, avacados, and wheat germ. New studies suggests that these foods may actually slow down brain aging. By eating a good diet that includes these foods, people will have higher cognative abilities at older ages as opposed to prior generations. According to research brain food is food that can enhance mental capabilities because of the natural neurochemicals they contain. When you eat certain brain foods like nuts (almonds, pecans, and peanuts), they can help you concentrate, tune sensorimotor skills, keep you motivated, magnify memory, speed reaction times, defuse stress, and perhaps even prevent brain aging. Other good brain foods are Omega 3 fatty acids, which can be found in fish. Eating the right kind of fats helps because the cell membrane which nerve signals pass through are fat-rich. Antioxidants are also very good for the brain. These can be found in berries. When applying these foods to my diet (when i eat blueberries and nuts and whole wheat, for example) I feel more focused in school. It really does make a difference when you add brain foods to your diet. Brain foods are foods that help your brain function on a daily basis. They contain certain vitamins and minerals that other foods lack that really help your brain. If you don't eat any "brain foods" then you could be left in a confused and have a little trouble remembering certain little things you might have remembered otherwise. Some examples of brain foods would be blueberries, salmon, flax seeds, eggs, whole grains, and broccoli. After I eat fish the next day I always feel on top of things and have better brain function that I had for the previous days. This is because fish has fatty acids, including DHA, that boosts memory by 15 percent. Soom foods are called brain foods because they give your brain the energy to carry out its functions. Brain foods are good for you because they help you perform at your best. A type of brain food that i include in my diet are eggs. Eggs have choline inside of them that helps the brain with memory. I have eaten eggs for the past few days and i feel a small difference. When you are little you are told "Eat This" and "Eat That" but why. The healthier we eat it the healthier we are. Certain foods however make your brain act quicker and access the full capability of your brain, otherwise known as brain food. Brain Food gives your brain the ingredients your brain craves to be its' best. Some brain foods include nuts, eggs, berries, and eats with high protein. Adding these to your diet will not only cause your brain to be its' best but also have your energy shoot through the roof! Brain foods are foods that help your brain to not only develop but to be nourished. The brain controls almost everything we do. The type of food we eat can have an effect on how in works both positively or negatively. Some brain foods you could include in your diet are: Fish, Beans, Peas, Eggs, Antioxidants, and Bananas. Everyday we have Breakfast, Lunch, and Dinner. We eat these meals in order to feed our bodies what they require, but what about brain foods? Brain foods are labeled due to giving your body special vitamins and nutrients that keep you energized and helps your brain to work at its best. 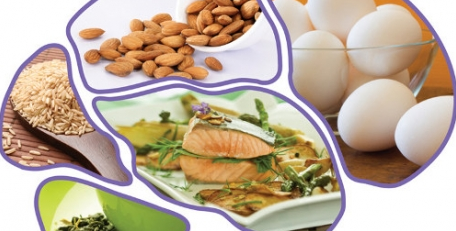 Fish, nuts, and eggs are prime examples of brain foods. Doctors like to suggest brain food to patients so that they will have better brain functions. Having a better functioning brain allows you to be more awake and have a good working mind. In some cases, the lack of brain food can make you feel weak and light headed. Brain food can act as energy for our bodies so we can keep up with our daily lives. Brain foods are designed to give the body the right vitamins and minerals to help you stay focus and keep your thought process up to speed. I researched brain foods and found that one of them is fish. Fish has omega 3 fatty acids that can slow the aging of the brain and can improve memory. Fruits play a hole role in the brain food group. They are made up of vitamins C and E and can help prevent damage to the brain. Also, some of the sugars in the fruits can give you energy. I personally love raspberries and blueberries and eat them all the time. I read that blueberries can help prevent Alzheimer's disease and help protect brain cells as well. Lastly, nuts are said to help the brain as well. My family usually only eat almonds because my sister is allergic to a lot of nuts. A good supplement can be a banana or even some kind of grain. Personally, I don’t always keep up with eating the proper “brain foods” but I try to eat a good breakfast to give me energy for the school day so my brain can process everything I have to learn or study. There is no denying that as we get older, our body ages as well. Nevertheless, that doesn't mean that our brain has to age with it- at least not at the same rate. These so-called brain foods are proven to help your brain by improving your memory, increasing your overall health, and giving your brain the energy to carry out every day functions and motor skills. Believe it or not, they can even help prevent illnesses such as Alzheimer's, dementia, or heart disease. For example, blueberries have been scientifically proven to help your brain from aging by protecting it from oxidative stress. This decreases chances of Alzheimer's and dementia- as mentioned before. Similarly, nuts and seeds provide you with a lot of Vitamin E that help keeps your brain healthy and alert as you grow older as well. Whole grains also contain Vitamin E and are good for your cardiovascular system, which allows good blood flow to the brain. This means that your brain and body are both healthier. 'Mood, motivation and mental performance are powerfully influenced by diet'. (psychologytoday.com) Some foods are considered 'brain foods' because of the evident affect on a person's performance. Omega- 3 is a big part of the outer membrane of the brain cells and helps maintain brain function. To answer the question: What makes them good for you? Their would have to be more than one answer but in simpler words, 'brain foods' will not turn an average person smarter or faster; they will aid the already functioning body to excel. Some examples would be fish and eggs. The other day I used canola oil which contains omega- 3 instead of regular vegetable oil. I also ate spinach, scrambled eggs and grilled tilapia. I used canola oil instead of vegetable oil because omega-3 helps my brain cells. Some foods would be considered brain food because they have some particularly desirable trait that other foods lack. From improved eye sight, to improved mood, these types of foods could help with anything and everything. You could try to include tomatoes into your diet because there is good evidence to suggest that lycopene, a powerful antioxidant found in tomatoes, could help protect against the kind of free radical damage to cells which occurs in the development of dementia, particularly Alzheimer's.